Take Control of Your Money! With the arrival of the brightly colored autumn leaves and cooler temperatures, it’s time to shake up your grocery list. Summer produce is coming to an end, and you can officially start eating all those pumpkin-flavored treats you’ve been dreaming about for weeks. But before you dive headfirst into fall, check out these five coupon-free budget tips to save money on groceries—and keep your belly full. 1. Shop locally. The farmers’ market is bursting with colorful, in-season produce this time of year. You can find everything from apples and blackberries to butternut squash and cauliflower. 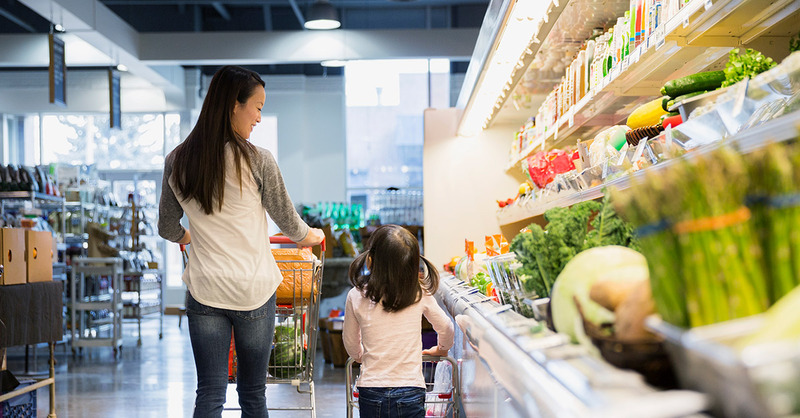 Shopping at the local market is a great opportunity to stock up on your food for the week—and enjoy a day out with the family. Plus, when you buy local produce, you eat seasonally and save some major change! 2. Buy in bulk. With winter on the way, now is the perfect time to stock up on classic pantry staples. You can get some great goodies at a major discount if you’re willing to buy in bulk—like rice, beans, oatmeal, olive oil and several seasonal spices. It may cost a little more on the front end, but smart bulk purchases will save you money in the long run. 3. Use a slow cooker. Slow cookers may feel old-fashioned, but they are one of the best tools you can have in your kitchen—especially in the fall. The temperatures are dropping and suddenly roasts, stews and other warm, cozy meals sound better than ever. And the best part? You can toss just about anything into the slow cooker, let it simmer for a few hours, and end up with a delicious meal for the whole family. 4. Host a soup swap. Speaking of warm, cozy meals, autumn is the perfect time to break out your favorite soup recipes. But don’t keep all that yummy goodness to yourself. Gather your friends together and host a soup swap. Each person makes a different soup and brings enough servings to split among the group. At the end of the swap, you go home with several soups to toss in the freezer and reheat throughout the fall season. 5. Cut back on meat. No, we aren’t challenging you to go vegetarian. But the fall season is perfect for things like porridge breakfasts and vegetarian chili dinners. Whether you’re saving up for stocking stuffers or just want to give the grocery budget a little squeeze, introducing “Meatless Monday” can help you pinch some major pennies. And hey, you can pick whatever day of the week you want. If you’re feeling rebellious, choose a different day altogether—it’s your party! That’s all there is to it. Now you can sit back, relax, and enjoy the beautiful fall weather. And keep in mind, when you save money on groceries, you have some extra change to buy a pumpkin dessert or two. Score! Use EveryDollar to set your fall grocery budget now—and stay on track for the rest of the season. It’s free and only takes 10 minutes to set up.